"The closer you are to Chernobyl, the less dangerous it seems." This is the theme of Ebling Library's latest exhibit, "After Chernobyl: Photographs by Michael Forster Rothbart." Though the Chernobyl of popular mythology is a dead, barren wasteland (or, in some tellings, a radioactive breeding ground for monsters), Rothbart's photographs tell a different story. The Chernobyl he shows us, nearly thirty years after the nuclear disaster, is filled with life in unexpected places. From the residents, many of them evacuees, of nearby "safe" towns and villages, to the workers and managers who maintain the inactive power plant as it is decommissioned, to the samosely—elderly evacuees who illegally returned to their homes inside the Exclusion Zone after the accident, and still live there now—the Chernobyl area is not quite as dead or barren as terrible horror movies would have you believe. 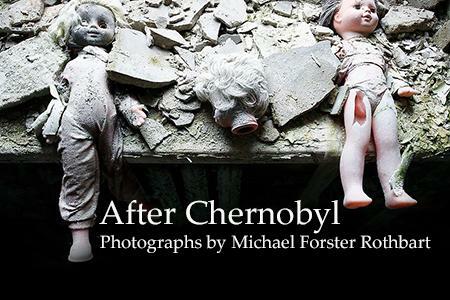 "After Chernobyl: Photographs by Michael Forster Rothbart" runs until August 31st in Ebling's third-floor gallery space. For more information on the Chernobyl disaster, you can check out these library resources. Lauren Redniss writes about Chernobyl in the 2012-13 Go Big Read pick, Radioactive. The once-flourishing, now-abandoned city of Pripyat, which was built to house plant employees and their families, has its own fascinating website, set up by an organization seeking to turn Pripyat into a "museum city." In the meantime, as seen in the Chernobyl Diaries trailer, there are guided tours that will take you into Pripyat and to the Chernobyl plant. If you're not feeling quite that adventurous, you can take a look at these photos of Chernobyl and Pripyat at the Telegraph.